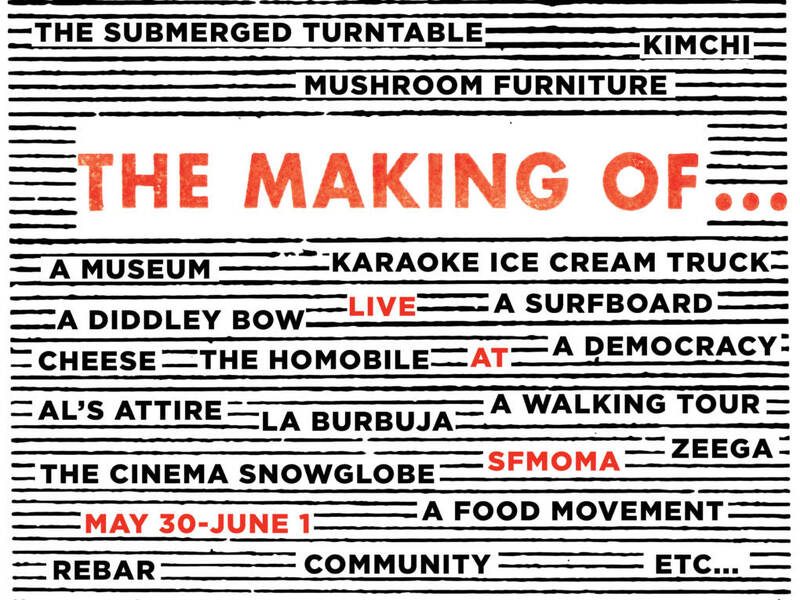 On Thursday and Friday, May 30 and 31 and Saturday June 1, The Kitchen Sisters and KQED present “The Making Of… Live at SFMOMA,” inspired by their radio series “The Making Of…” about what people make in the Bay Area and why. Over one hundred makers will present their work, process, and expertise over the course of the 3 days, filling the museum with inventions, contraptions, art, food, stories, music, imagination, community. As SFMOMA closes for renovation and expansion, a vast community of makers from throughout the region come share their skills and crafts and tell their stories. The Kitchen Sisters will host three days of drop-in demo and conversation tables and presentations. Thursday and Friday will conclude with a daily maker’s talk and gatherings. “The Making Of… Live at SFMOMA” captures the art, creativity and innovation going on in backyards, workplaces, cultural institutions and public spaces throughout the region. This three-day event is part of SFMOMA’s Countdown Celebration and entrance to the museum is free. The Making of… a Charitable Food Movement / Mission Street Food & ShareTable.org with Mission Chinese Food, Tartine Bakery, Bar Tartine, Commonwealth, Wise Sons Deli, Tacolicious, La Cocina, Wise Sons Deli, Central Kitchen and more.